More and more people are replacing their old thermostats with programmable or smart thermostats. While this is a great way to lower your utility bills and ensure that your HVAC functions more efficiently, it could all be for nothing if your thermostat is not placed properly. We are proud to serve residents of New Jersey by offering a wide range of HVAC services, including repairs, maintenance, and installation. If you’re having a problem with your HVAC, or you simply want to ensure that it is functioning properly, we are here to help. 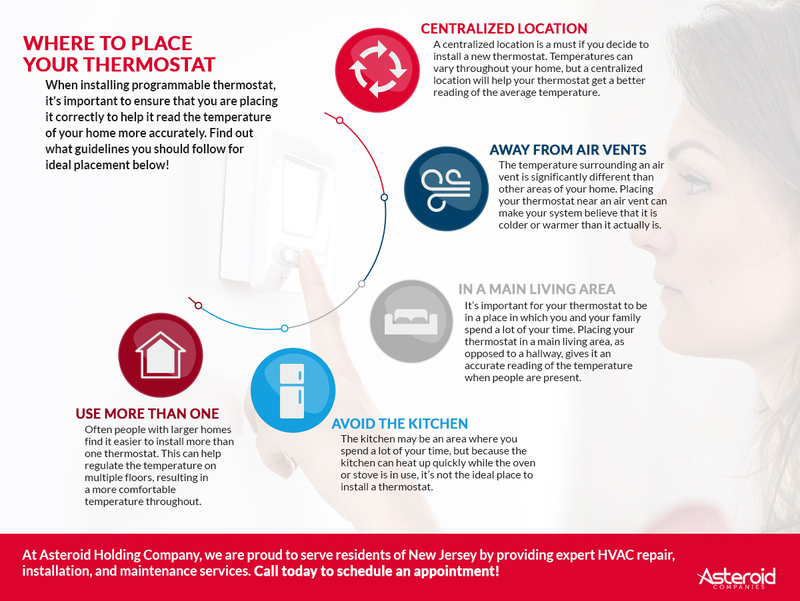 Contact our expert HVAC Company for all of your needs, and read below for tips that you should keep in mind when placing your thermostat. A thermostat helps to regulate the temperature in your home. Therefore, it’s a good idea to place your thermostat in a central location to ensure that the temperature reading is the most accurate. Temperatures can fluctuate throughout your home, especially in rooms with large windows. If you place your thermostat in an area that is normally colder or warmer than the rest of the house, it could result in an inaccurate reading that leaves the rest of your home feeling uncomfortable. Have you ever stood next to an air vent when you’re feeling too cold or too hot? 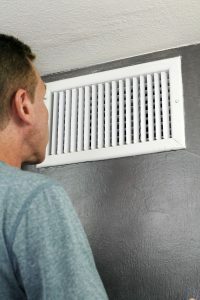 If yes, then you probably noticed that the temperature around the air vent is significantly different than the temperature in the rest of the house. With this in mind, it’s a good idea to avoid placing your thermostat near an air vent. The air surrounding an air vent is typically not the same temperature as the rest of your home, and placing your thermostat right next to an air vent will confuse your device into thinking your home is warmer or cooler than it actually is. The point of a thermostat is to control the temperature and make it more comfortable throughout the house. However, many people choose to place their thermostats in hallways or rooms that go unused most of the time. While it may seem like a good idea to place your thermostat in an area that is out of sight, it can actually make it more difficult to control the temperature in your home. You want to ensure that you and your family are comfortable in the areas you use most often. Therefore, it’s a good idea to place your thermostat in a main living area, like your living room, as this will give a more accurate reading of the temperature when people are present. If your family enjoys spending time together in the kitchen, you may feel it is appropriate to place your thermostat in the kitchen, because it is an area of your home that you use quite often. However, if you spend a lot of time in your kitchen, then you know how hot it can get when you are using the oven or the stove. There are a lot of appliances in the kitchen that can easily raise the temperature to an uncomfortable level, especially if there are a lot of people present. For this reason, it’s best to avoid placing your thermostat in the kitchen. The added heat can cause an inaccurate reading, and as a result, the rest of your home may be uncomfortably cold. Those who live in larger homes may find that the temperature in their homes fluctuates more from room to room. If you have multiple levels in your home, you may also find that your basement is cooler than the middle floor, which is cooler than the top floor. Trying to regulate the temperature throughout a large home can be an extremely difficult task, and you may even see higher utility rates. For this reason, it may be a good idea to consider placing multiple thermostats throughout your home. This can help regulate the temperature, and may help your HVAC system work more efficiently. When you choose our heating and air conditioning company, our experts work hard to provide you with the high-quality HVAC services you need. Our HVAC company offers everything from repairs to installation. If you’re looking for a company that will put your needs first, then look no further than our team in New Jersey.